Whenever you start learning something new, the hardest part is always the terminology. All the words are in English, but they are often used in ways that are counter intuitive. Folders is one such term. In the physical world, you can have a manilla folder, or a plastic book-like folder, or you could just have a hanging folder in a filing cabinet. The one trait all those physical objects share is their ability to hold things – usually pieces of paper. Computer terminology has borrowed that idea of holding and grouping things for the folders on a computer, but there the real world analogy ends. 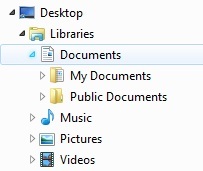 On a computer, folders can hold everything from documents and music, to applications [like Word or Excel or your favourite browser]. Computer folders can also contain other folders, lots of them, and those sub-folders can contain folders of their own. Once you realise that, the similarity to real world folders becomes very thin indeed. The terminology, however, remains. 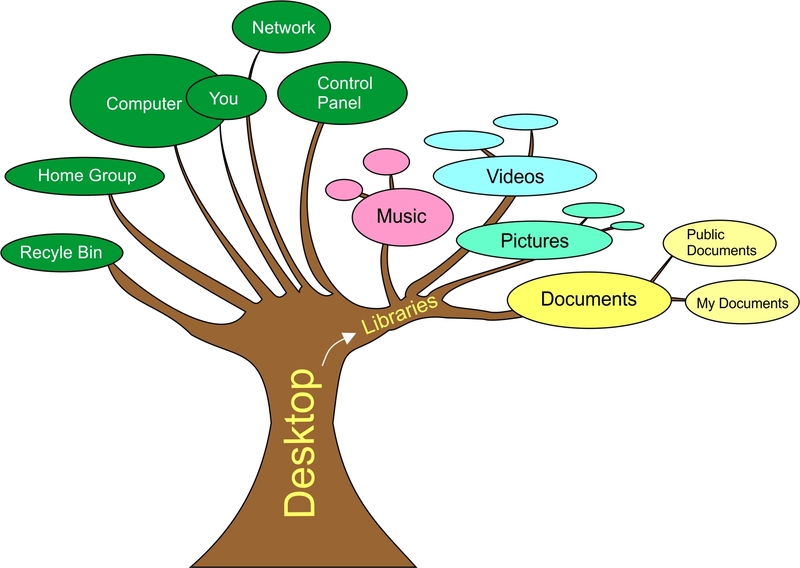 In the graphic above, the Desktop is the trunk of the tree. From there, 7 main branches lead to important categories of ‘things’, including the Control Panel and the Recycle Bin. However for you and I, the most important branch is the one called ‘Libraries’. As you can see, sprouting from the main branch of Libraries are smaller branches that lead to Music, Videos, Pictures and Documents. And finally, hanging off Documents are two folders called ‘Public Documents’ and ‘My Documents’. Due to lack of space, I haven’t labelled the smaller branches leading from Music, Videos and Pictures, but they too have folders attached to them. For example, Music has folders called My Music and Public Music. In the following examples I will only talk about the My Documents folder, however the same rules apply to all folders. The tree structure circled in red does not look like our graphic of the tree, but each indentation signifies a branching. Thus Libraries is indented from Desktop, and Documents, Music, Pictures and Videos are all indented from Libraries. Now let’s have a closer look at the ‘Documents’ branch of Libraries. 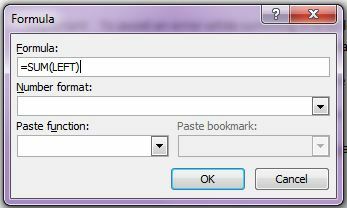 To expand the branches of the tree structure, either double click Documents, or click the small arrow in front of it. You should now be able to see the two yellow folder icons in front of ‘My Documents’ and ‘Public Documents’. 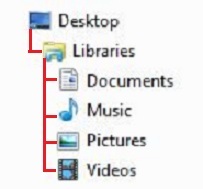 At this level of the tree structure, Windows 7 creates the categories and folders in order to make using Windows programs easier. Unfortunately there is a price to pay for this ease of use, and it’s the same price you pay in the real world when you chuck all your important documents into one very big box – finding things becomes difficult. If you’re reading this, you probably already know about the black hole. What you may not know, however, is that you can organize your documents by creating your own folders within My Documents. Creating your own folders is a simple, 3 step process. Step 1 If you are still in the Computer window, click My Documents. If not, double click the Computer icon – – on Desktop, expand Libraries, expand Documents, and then click My Documents. Step 2 Up the top of the Computer window you should see a number of options. The one we want is ‘New Folder’. Click ‘New Folder’. Simply type in the name you want to give this folder and press Enter. Just remember that the name of the folder should be that of a category or logical group. For example, if you write a lot of memos, you could group them by recipient name, or month, or subject matter. Once you have created your own folder[s] you can drag and drop existing documents into them – much like you would file papers in a filing cabinet. 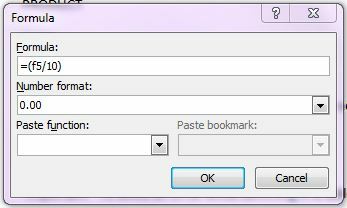 Simply click on the document you want to move, and keep the mouse button held down as you slowly move the file to its new location. This is the ‘drag’ part. In the screenshot above, I dragged a file up to ‘1 Testing’. 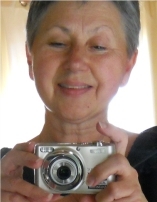 The shot was taken just before I released the mouse button. Dragging and dropping existing documents into folders is tedious and time consuming. A faster, easier way to organize your documents is to save them directly into the correct folder[s] right from the start. To demonstrate how this is done, open Word 10 and type something onto the blank page that is displayed. Double click your folder to open it. Now you are ready to name your document as you would normally. 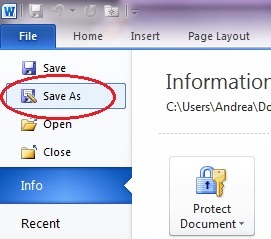 Type a name for your file and click the Save button. You have now learned how to create and use folders. The next time you want to edit, or print a particular document, you can use your named folders to narrow down your search to just a few documents instead of possibly hundreds! This how-to is part of an assignment I have to do for my Certificate IV in Training and Assessment. It takes the place of work-based training so I would really appreciate any comments you might have, or any questions as your feedback will become part of my training process. p.s. This is my 400th post. I honestly can’t believe it. Time really does fly when you’re having fun! Okay, I’m going to start with the assumption that most people will know how to create a simple table in Microsoft Word 10. I’m further going to assume that most people are like me, and put their headings in the first row – so we know what data to enter where. The assumption about the headings is important because it will have an impact later on. Given how few items there are in this table you could easily do the sums in your head and just type them in. But why whip out the calculator when the table should be able to do the sums for you? Click inside the Sub-Total cell of Part #123. Next, click the ‘Layout’ tab at the top of your screen, and select ‘Formula’. 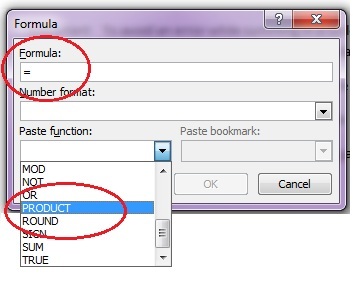 Under Formula, Word automatically displays the formula it thinks you might want to use. ‘=SUM(LEFT)’ is not the one we want so either backspace over it, or highlight the whole thing and delete. 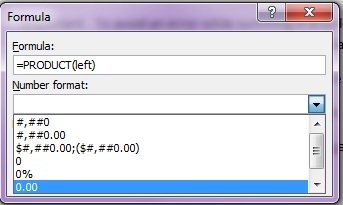 Hit the equals sign on your keyboard [‘=’]. Now click the arrow next to ‘Paste function’ to display the list of available functions. The one we want is PRODUCT. 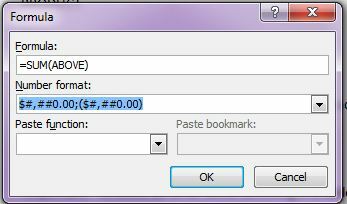 While you’re there, click the arrow next to ‘Number format’, scroll down the list and select the decimal format. 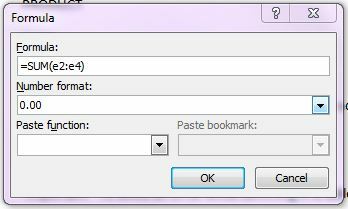 Click OK and Word will multiply all the numbers to the left of the current cell until it reaches a blank cell, or, as in our case, it reaches some plain text. The number that results from that multiplication will be inserted into the Sub-Total field of the table. Now we’re going to add up those three numbers, and have Word put the result in the Total column. But before we do that I need to explain about co-ordinates. In Word tables, however, we have to imagine those nice, neat co-ordinates. I didn’t imagine them properly and spent hours trying to work out why my formulas weren’t working. You see, I counted the first row of data as row 1. Wrong. That honour goes to the column headings I put in. Thus the co-ordinates I need to enter into the formula to add up the three Sub-Total amounts are e2:e4 [not e1:e3]. Click inside the empty cell in the Total column, go to Layout, Formula. Because Word can’t find any numbers to work with, the popup just shows the equals sign [‘=’]. As before, display the list of available functions, but this time, select SUM. Just two more formulae to do! In the empty cell next to GST, click inside the cell, open Layout, select Formula and delete the existing formula from the popup. This time we are doing it ALL manually. The Total column corresponds to column F, so the total amount for parts corresponds to f5 [because the headings are on row 1]. This may sound obvious, but trust me, it’s very easy to forget, especially when you’re tired. Our last task is going to be the easiest of the lot. All we have to do is add the GST amount to the figure for total Parts. Click inside the empty TOTAL cell, click on Layout [unless you’ve already done so], and select Formula. The popup shows the exact formula we need, already selected for us – i.e. =SUM(ABOVE). This formula will add up all the numbers that occur above the cell in which the formula is located. That means it will add Parts and GST only because we kept the rest of the column empty. Now click OK and see the results of our hard work! And of course, the $ sign is in the wrong place. -sigh- To make this beast look as pretty as we can, we’re going to make the Total column fit the widest entry in it. 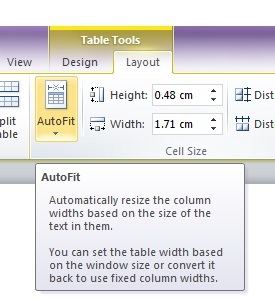 With the Layout tab open, click Autofit, and select ‘Autofit contents’. The Total column is now wide enough to show the $ sign properly, however the numbers still don’t line up nicely with the right hand side of the column. Before I shuffle off for a well-deserved cup of coffee, I have to say that this has been a lot of work to achieve something Excel probably could have done faster. The point is though, with a spreadsheet you end up with a spreadsheet. With Word tables, you end up with something that can be incorporated into a complete, professional looking document. That said, I wouldn’t dream of using a table for masses of data – that is not what it is designed for. Tables are a quick [once you know what you’re doing] and dirty tool for smallish jobs.